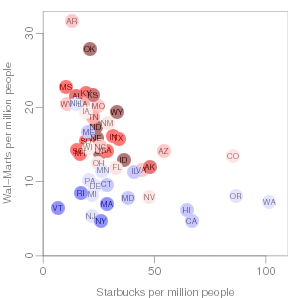 An interesting stat project at Columbia: Starbucks states versus Wal-Mart states. If you imagine a cutting line to separate the blue and red states, it looks to me like it would be horizontal at about 11 or so. Thus, all the work is being done by the Walmart’s dimension not by the latte dimension. This is an easy logit or probit to run if someone has even more time on their hands.